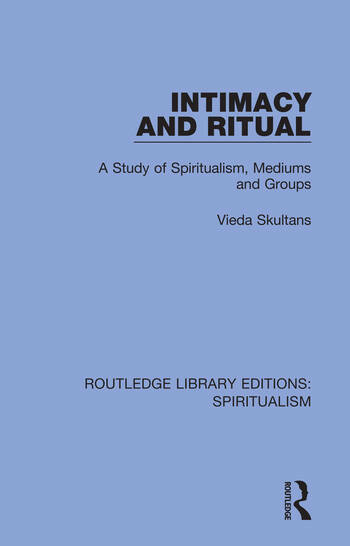 Originally published in 1974 Intimacy and Ritual is a sympathetic study of spiritualist activities and their relation to the practitioners’ secular lives. The book, in particular, looks at the therapeutic function of spiritualism. Based on the author’s fieldwork as a ‘participant observer’ among spiritualists in a South Wales town, the research covers spiritualists services and meetings as well as interviews with spiritualists in their own homes. The book gives an accurate account of spiritualist doctrines and beliefs about the spirit world. The book postulates that spirit possession always relates to illness and shows how this is often the physical counterpart of social malaise. Throughout the study, spiritualism is seen in terms of the coping techniques and the rewards which it offers its members. The book shows that spiritualism is more highly regarded as a problem-solving source than the formal care-giving organizations, such as psychiatrist hospitals and the social work agencies. Healing activities are interpreted as a symbolic enactment of male and female roles ideally conceived, and spiritualist messages offer symbols and explanations of illness and misfortune.